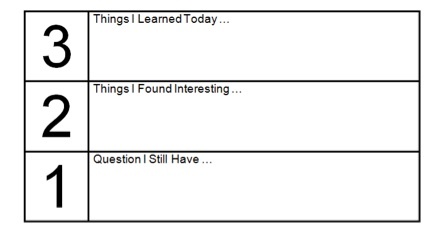 ​Exit Slips are a tool used to check students understanding of new material. This strategy requires students to respond to proposed questions either at the end of a lesson or the end of a class period. This in turn, will help students reflect on what they have learned and allows teachers to quickly assess students understanding of the material. They provide teachers with an informal measure of how well students have understood a topic or lesson. They allow students to express what or how they are thinking about new information. Ex. Write one thing you learned today. Ex. Discuss how today's lesson could be used in the real world. Ex. Write one question you have about today's lesson. Ex. Did you enjoy working in small groups today? Why or why not? 1. What are the two main components or factors found in every ecosystem? 2. Provide at least three (3) examples of each factor. ​Math: In today's lesson, students represented different numbers using base ten blocks. Reading: Students will be required to fill out a 3-2-1 exit slip at the end of today's lesson on predicting. They will need to write things that they learned about predicting, 2 things they found interesting and 1 question they may still have at the end of the lesson. This will allow students to apply what they have learned by focusing on the learning target (making predictions). Wagner, Barb. "Sharing Responses to Literature via Exit Slips." Classroom Notes Plus August (2005): 1-3. Web.